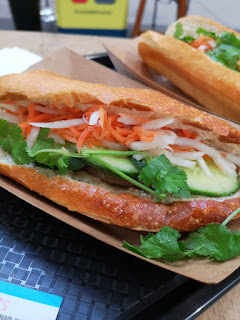 Welcome to a brand new blog post. I talked to you all about the Yorkshire Soap Company's Harrogate store last week, so, I thought that, this week I would talk to you all about the things that I got from the event. 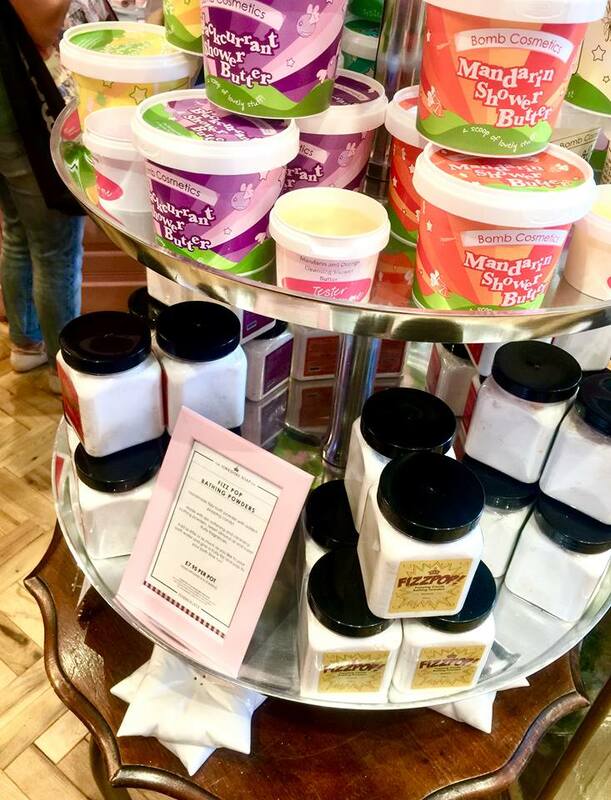 As I said within the intro, the amazing people at Yorkshire Soap Company invited myself and Luke to check out their amazing new store within Harrogate, and, at the event, myself and Luke decided to get some goodies whilst we were there. Luke got more than myself, but, I thought that I would talk to you all about what I got. Sadly, due to splitting my time between living within Leeds, and, Bradford, I decided to not get too much. My mind instantly went to, 'if you need anything in the future, you can always travel back, or, go and visit the amazing Leeds branch'. 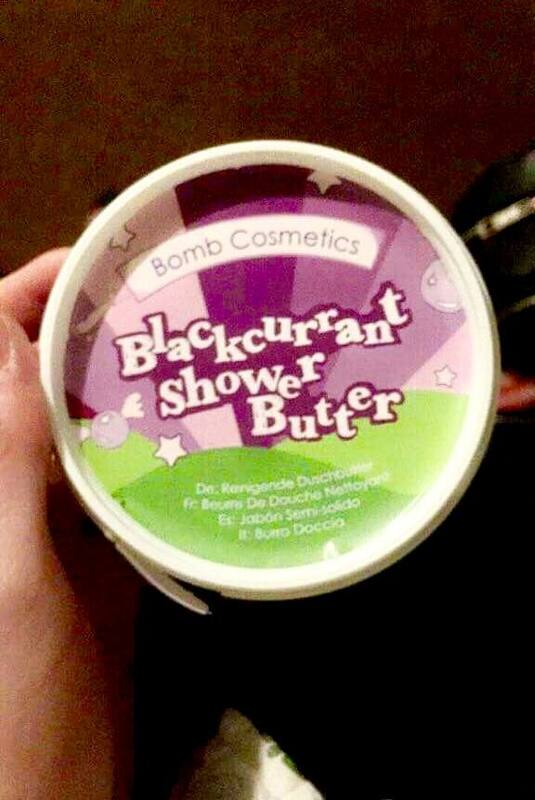 The first item that I got was, the, Blackcurrant Shower Cream, that is from Bomb Cosmetics but is stocked in Yorkshire Soap Company stores. This little blackcurrant beauty contains Shea Butter, which helps ton moisturise any type of skin for quite a long time, Blackcurrants, Blueberries, Strawberries and other goodies. The Strawberries and Blueberries add to the fruitiness of the Blackcurrants in my opinion. 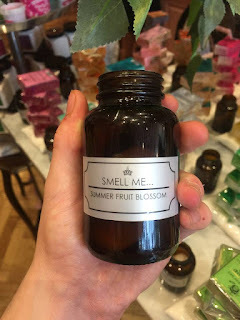 The Blackcurrant scent comes through the most, so, if you love anything Blackcurrant scented or want a product that reminds you of Ribena, then, you need this in your life. I have quite dry skin due to many things, and this even moisturises my skin for a while. It comes in many different scents but I was going off a first scent basis. If I went back to get another then I would probably get the Mint Choc Chip or Pina Colada scents. 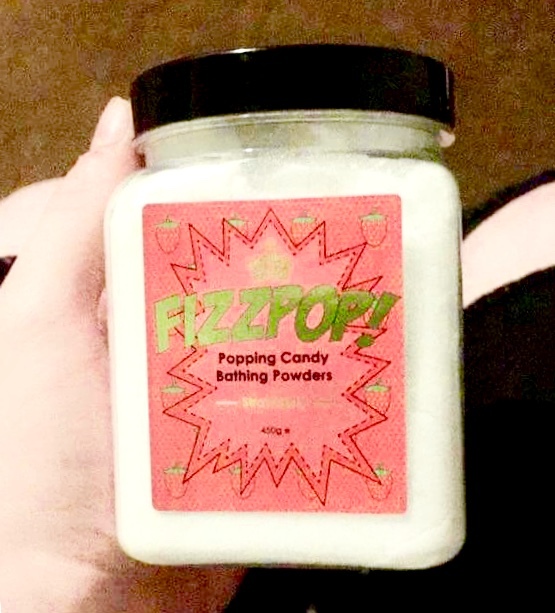 The tub of this product is quite big, and, a little seriously goes a long way! Up next is, Yorkshire Soap Company's Strawberry Fizz Pop. 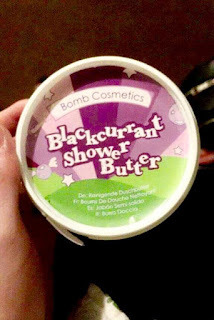 This is one of the most amazing bath products I have ever used and I'm not joking or exaggerating. The concept of this perfect product is, that, you scoop a preferred amount of the product into running water, and then once you turn the tap off you can hear it fizz, crackle and pop! This product on it's own gives off such a powerful scent and I absolutely love it! YSC sell other scents of Fizz Pop, including, Lychee, Watermelon and Banana. I urge you to get one of these too. I might use mine tonight with some other Strawberry Products to ensure that everyone in a five mile radius can smell it. 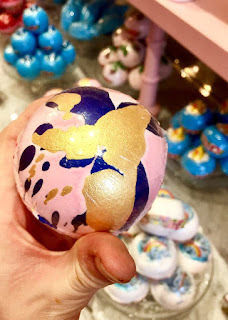 Coming up next on the haul train is, bath bombs. I didn't get manty, due, to only having a bath in Bradford which means I end up hauling bath bombs and such and then end up using them non stop when I can. I nearly bought Peppermint Cream (an absolute favourite of mine along with Invigorate) but I didn't, I will probably end up in the Leeds branch by the time this is up though, so, that might have changed. I did get a couple of the Bomb Cosmetic ones mainly for the aesthetic than anything else. I got a Sparkle and Shine, which is covered in glitter and smells like Vanilla Cupcakes. I also got It's Not Easy Being Green (a bath bomb based on Kermit the Frog) which smells like Cucumber mixed with Grass a bit to me, a Meow bath bomb (I can't find the proper name) which smells of Oranges, and a bath bomb which smells like Blackcurrant (goes great with the Shower Butter) and comes with a toy Dolphin. Carrying on, soaps are the next big batch. The first soap that I got was for Michelle. Myself and Luke smelt this, and, it instantly reminded us of Michelle and the perfume that she wears on a daily basis, so I knew that she had to have it. This soap is called Summer Fruit Blossom. The next one that I got for myself was, Caramelised Orange, and, yes it smells as divine as it sounds. Sweet but bright and zingy. Great for this time of year. I also got two soaps given to me in a goodie bag, Humbug which smells of clean and refreshing Mint, and another which is not with me and I can't remember the name of so I will change this when I get to it. The soaps from Yorkshire Soap Company are amazing. The Glycerine based ones are great for shaving with! Furthermore, the goodie bag contained more amazing items from Yorkshire Soap including a superb slice of Cake shaped Soap in the Yorkshire Lass range which smells light and florally and a Bath Truffle in the same scent. When I first found out about YSC a few years ago, I wasn't sure about this scent, but I now love it! I love the Bath Truffles as the moisturise the skin. I know, mousturising baths make the tub slippy but its worth it for smooth hydrated skin all day. 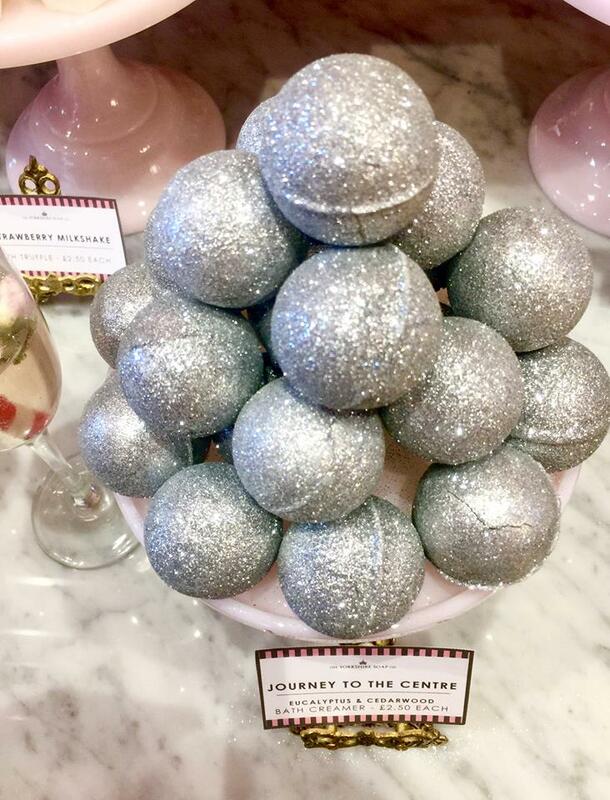 I think that they also do a Strawberry Milkshake and Cola scent Bath Truffles which smell absolutely divine. 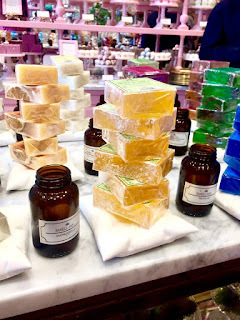 Have you ever been to Yorkshire Soap Company before? Let me know down below! 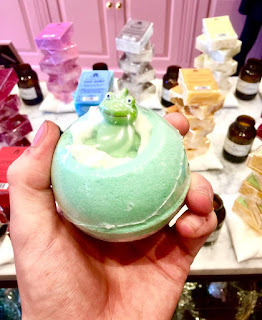 I hope that you have enjoyed this bath based blog post. I hope that you come back next time for another blog post.